Moscow believes the United States' accusations of Syrian government involvement in a 2013 chemical attack in Ghouta are baseless, Russian Foreign Ministry spokeswoman Maria Zakharova has said. Zakharova said at a weekly briefing on Thursday that as the State Department "once again named the Syrian authorities as those guilty of a chemical attack four years ago," adding that the US hasn't presented any proof. She noted that Washington also "rubberstamped" its accusation against Damascus of perpetrating the April 4, 2017, attack on Khan Sheikhoun. "We still have not heard a coherent, objective reasoning in this respect. We still do not understand why Washington is so confident in [Syrian President Bashar] Assad's guilt in these incidents," Zakharova said. At least 281 people were killed in an alleged chemical weapons attack in the Damascus suburb of Ghouta on August 21, 2013, with some reports putting the death toll at 1,729. The Khan Sheikhoun incident that took place on April 4, 2016 left 80 people dead, including children, and injured 200 more. The National Coalition for Syrian Revolutionary and Opposition Forces, supported by the United States, blamed Damascus for the attack. The Syrian army strongly rejected the accusations and laid the blame on local militants. 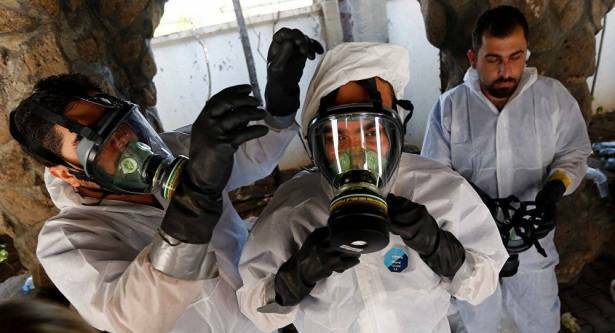 The Syrian authorities said that they had never used chemical weapons against civilians or terrorists, and that the nation's entire chemical arsenal had been destroyed under the control of the OPCW. Reacting to the incident, Washington, which has not presented any proof of the use of chemical weapons by Damascus, launched 59 cruise missiles at the Syrian governmental military airfield in Ash Sha'irat on April 7. On April 21, Syrian President Bashar Assad told Sputnik that there was no chemical weapon attack in Idlib, adding that the reports were a false flag and a fabrication which was used to justify a US missile strike on Syrian airbase.